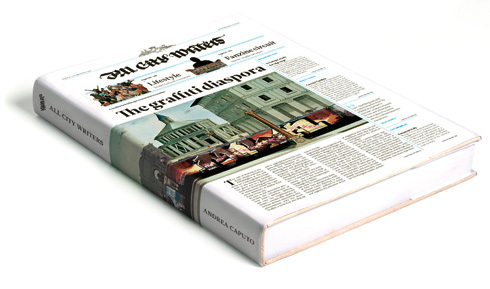 “Once the writing movement became popular, almost every bookshop disposed a graffiti section on their shelves, revealing how much this culture had been absorbed by society,” says Andrea Caputo, creator – or, in his words, “curator” – of ALL CITY WRITERS. The title ALL CITY WRITERS describes a vast research project on the writing movement, focussing particularly on the process of its exportation from New York to the whole of Europe during the 80s. International crews, fanzine networks, inter-rail travelling are, among others, key chapters in which writers have become protagonists. The whole project developed from the consideration that many of the stories that writers experience are just lost in time. Other than the pictures of their pieces, the adventures, and sensations a writer lives through often just disappear like so many other bits of oral culture. For that reason, ALL CITY WRITTERS contains the largest contribution of texts ever published in this field. ALL CITY WRITERS tries to document the evolution and the consequences of a countercultural phenomenon that over the course of a few decades provoked a change in the aesthetics and the rules of communication of modern day society. With 1.230 pictures, 620 articles, 410 full-colour pages, and more than 250 writers involved who contributed their own stories to the project ALL CITY WRITERS is a heavy-weight of graffiti literature – and that not just in terms of the actual size and weight of the book. Since Carhartt has been a steady supporter of editorial projects focussing on graffiti, be it in the form of books, magazines, and fanzines, it was only natural to collaborate on ALL CITY WRITERS and to support its distribution. ALL CITY WRITERS by Andrea Caputo is published by Kitchen93 from Bagnolet, France, and is supported by Carhartt. The book released on 7 November will be available at well-selected bookstores and of course in all Carhartt stores. A European exhibition series with the participation of ALL CITY WRITERS contributors at selected Carhartt Stores will follow in early 2010.